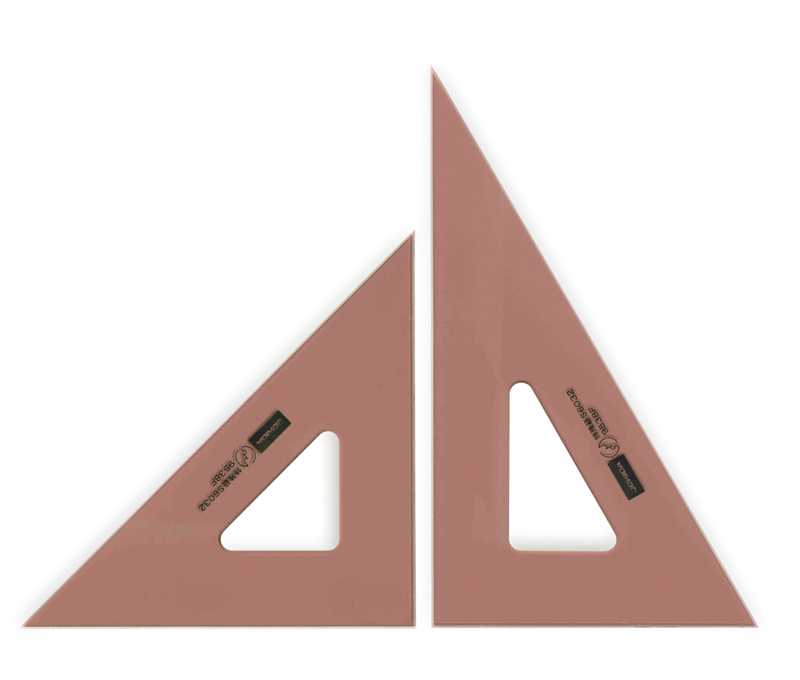 A triangle is a drafting tool used to draw accurate parallel lines, vertical lines, and other angled lines. Generally, two right-angled triangular pieces of differing angles form one set. On one piece, the angles are 90°, 60°, and 30°; on the other, an isosceles triangle is formed with angles 90°, 45°, and, 45°. One is scaled; the other is not. Some transparent triangles made from plastic and acrylic feature grids. In addition to plastic and acrylic triangles, there are also triangles made of stainless steel and wood. Triangle sizes vary, but those used for drafting are usually between 10 cm and 40 cm. 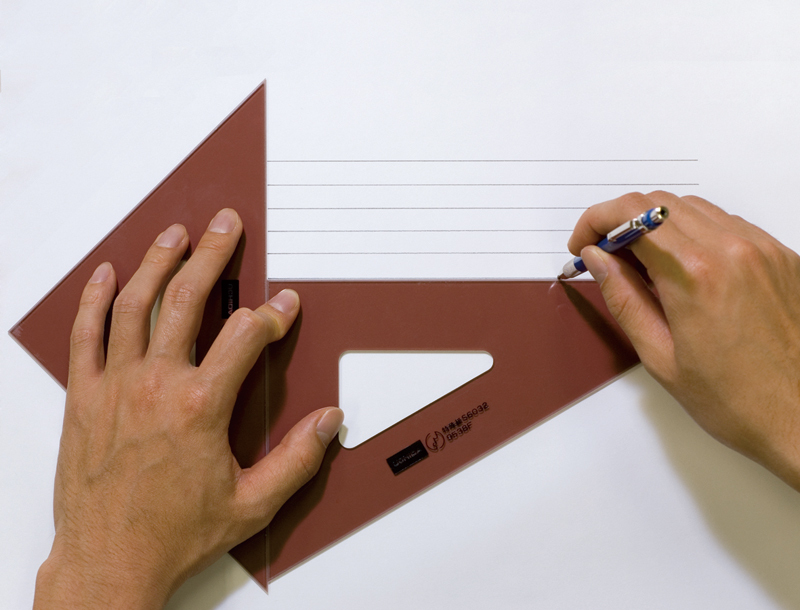 Larger triangles are often used for applications like drawing lines on the blackboard in elementary school classrooms. When you use a triangle to draw horizontal or vertical lines, you need to use two triangles together in tandem. By combining the two, you can draw lines at 30°, 45°, 60°, and 90° angles. You may also use a triangle in tandem with a T-square. To draw parallel lines, for example, securely fasten the two rulers together and then move the ruler on the right side downward from the top, drawing a line from left to right. Refer to the illustration for a diagram of this procedure. The triangle first appears in the literature of the early Meiji period under the name “triangular ruler” (sankakuki). 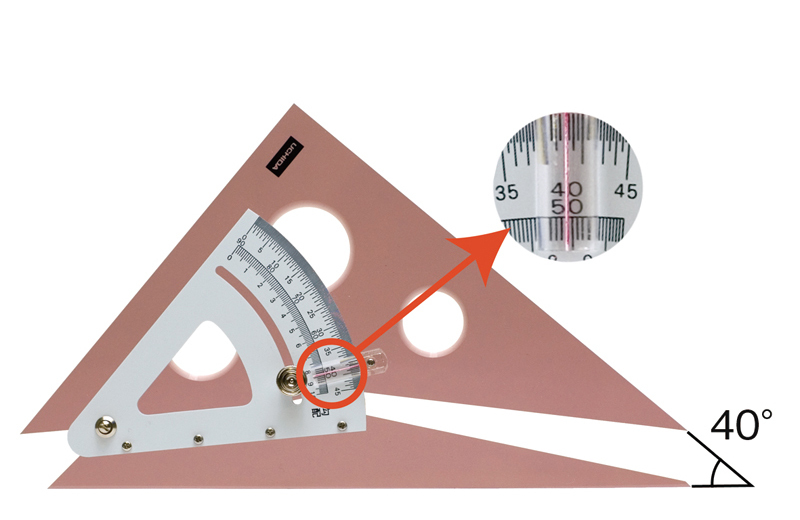 At the time, it was mainly used for observing right angles and thus had a motley assortment of other, non-right-angle angle markings, but in the mid-Meiji period, people started using triangles in the two combinations-the 90°, 60°, 30° angles and 90°, 45°, 45° angles-that we see today for the purpose of drawing horizontal, vertical, and diagonal lines. There is also another kind of ruler that resembles the triangle and can draw similarly angled lines: the adjustable triangle. Made from two movable triangular pieces connected on a gradated board with a protractor attached to it, the adjustable triangle allows the artist to adjust the angles of the two pieces using the gradations. You can make various angles by combining the angles with the triangle. When using an adjustable triangle, however, you can draw other optional angled lines and also measure angles. 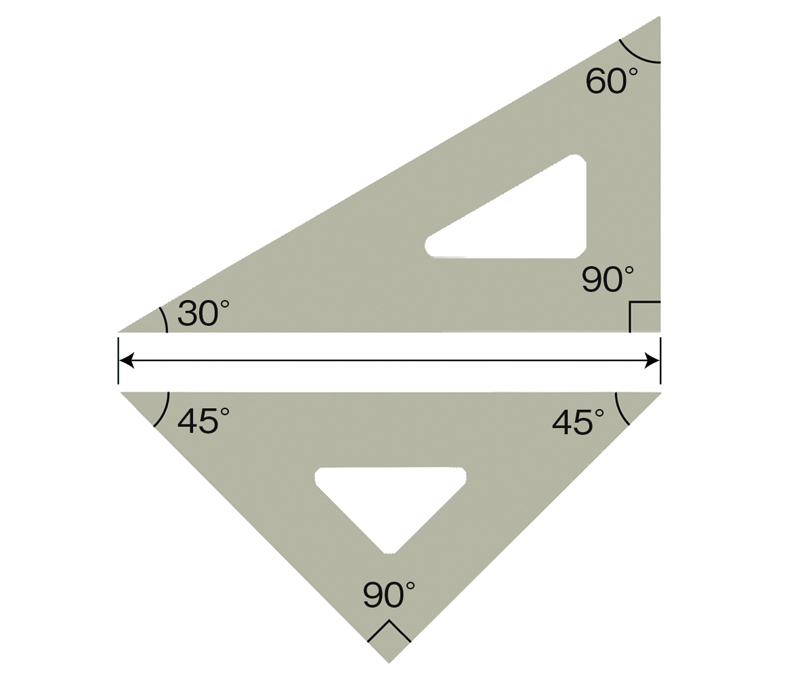 Triangles used for other drafting objectives include navigational triangles that help users read nautical charts. Triangles, adjustable triangles, and other similar tools are available for purchase at office supply stores, art supply stores, and other stores that deal in drafting merchandise. Use your left hand to hold both triangles in place. Move the triangle on the right downward.